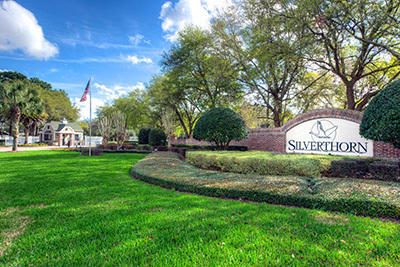 Silverthorn is a gated and guarded golfing community, with an award-winning championship golf course. Along with golf, the community clubhouse is fantastic. The clubhouse is a great place for events, to come for dinner, it has weekly specials and is open to the public 7 days a week. Enjoy drinks, food, and cocktails inside or on the veranda with a panoramic view of the golf course. The country club offers an elegant setting, accommodating 20-300 guests. They have certified chefs and professional service staff. They can also do themed buffets and events. Have your perfect wedding ceremony here with all kinds of options such as trellis arches, chairs and chair covers, decorations, horse and carriage rentals, pastor/ministers, photographers, and videographers. Silverthorn Country Club is a semi-private golf course. Membership is optional.